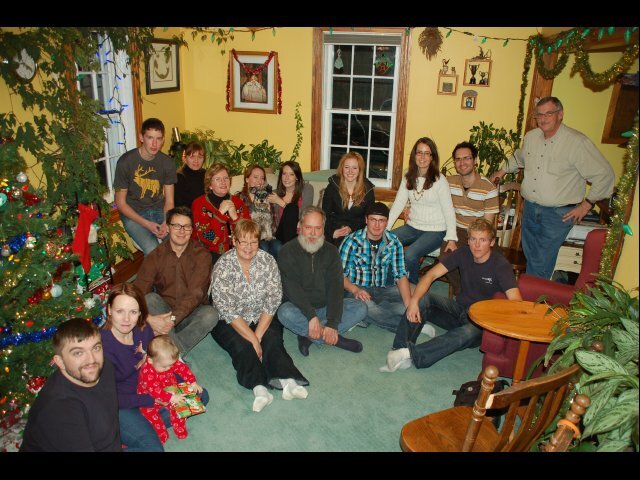 Last week my uncle facebooked me to say he was planning an impromptu family gathering at his home in Napanee. This is a rare occurrence for my family. We’re close in some ways (we’re mostly all connected by facebook, and stay in touch) and we all look pretty much the same, but large family events are not common. So my partner and I decided to make the trip to Napanee and back to participate. My uncle is a lover of kale, smoothies and carrot juice, but is otherwise mostly uninitiated in the ways of vegan cuisine. He and the rest of my family, however, are very open to trying new things, and were enthused when I told them I would bring along a few dishes to share with everyone. Of course, then the pressure’s on. My food had to be not just passable, but fabulous. There was no margin for error. And how would I decide what to bring, from my extensive repertoire of vegan wonderfulness? 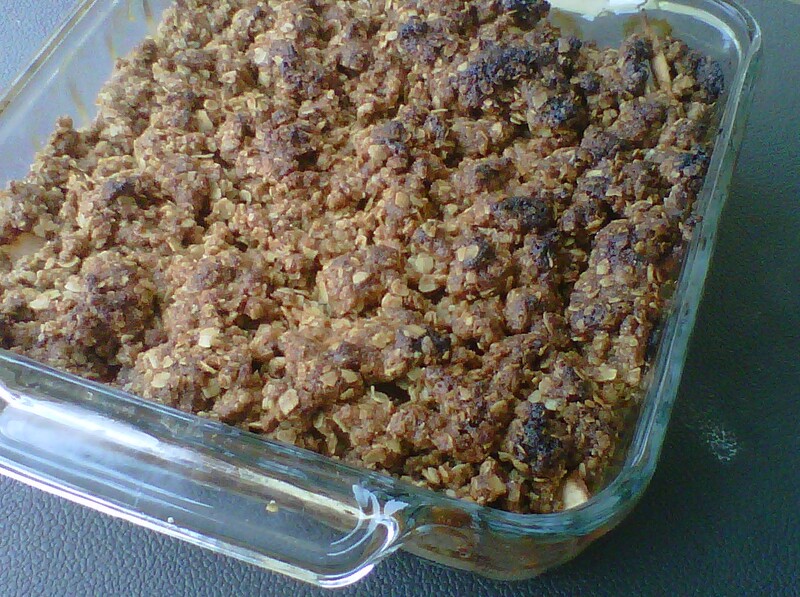 The apple crisp BEFORE part of the crisp was stolen by squirrels. The choice of dessert was made easy with the purchase of a 10 pound bag of apples. Apple crisp it would be! My partner says I make the best apple crisp ever, so it’s usually a good bet. So I prepared that first, and set it outside to cool. Next, I prepared miso gravy, which is super yummy and light, and also excellent on poutine. Imagine my amusement when I went out to put the miso gravy in the cooling zone, and discovered that about 1/4 of the “crisp” on the apple crisp was missing! It’s a good thing that I think squirrels are adorable. I rectified the situation by patching it up with some “crisp” remaining from a leftover piece of apple crisp made for a Sunday event with the in-laws. My family’s pretty “salt of the earth” so I don’t think they minded too much that they’d shared dessert with a hungry squirrel. Then, I spoke on the phone to my uncle’s girlfriend, who was organizing the party. She told me she was disappointed that she missed out on trying my mac & cheez the last time I’d visited. So, I made an executive decision to make mac & cheez as well. If a non-vegan wants to try vegan mac & cheez, then try it they shall! Neil's Ham & Cheez biscuits. Nom! 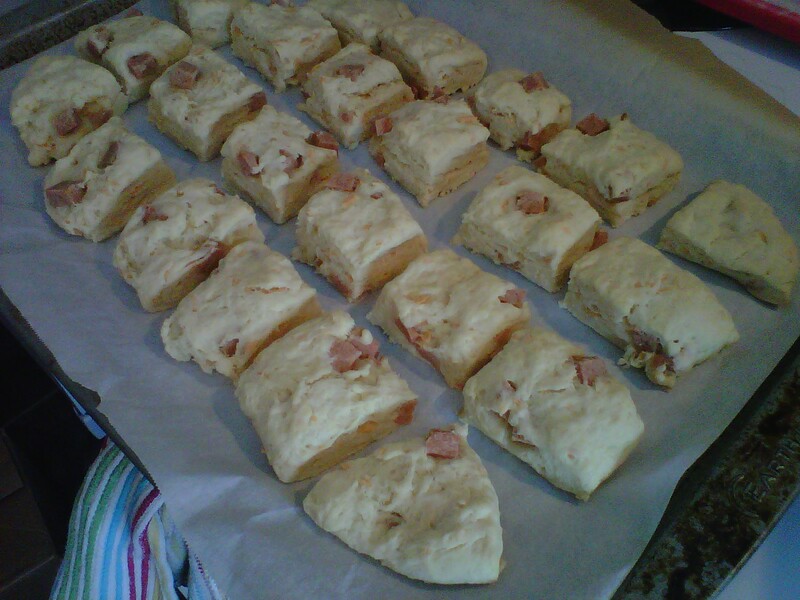 Next, I set upon making Neil’s ham and cheez biscuits which I had delighted in at a potluck past. I started small, making one batch first just to ensure I had the magic touch. They. Were. Amazing. So, I made a second batch. Forty-eight little ham and cheez biscuits! Although there were much fewer than that by the time we arrived at my uncle’s house. I blame the squirrels. The last frontier of the day was preparing cheez kale mashed potatoes. First, I had to peel five pounds of potatoes. My uncle had expressed a great deal of concern about having enough potatoes, so I figured no less than that would do. The cheez-ness was attained through nutritional yeast, unsweetened almond milk, garlic powder, salt and pepper, and earth balance. There is no recipe, I just made it up as I went along. Boil the potatoes (and blanche the kale), mash them up until your muscles are sore, and throw in random amounts of the aforementioned ingredients. Peel and slice (1/8 to 1/4 inch slices) about seven MacIntosh apples. Put them in an 8 x 8 glass baking thing. Sprinkle with lemon juice. In a medium sized bowl, cream half a cup of vegan margarine (I use Earth Balance or Becel Vegan) with 3/4 cup of brown sugar. Add 1/2 cup of flour (I use spelt). Add 1 tsp. cinnamon. Mix in 1 cup of oats. Sprinkle the crisp on top and cook at 350F for about 30-40 minutes. Melt about 1/4 cup vegan margarine in a saucepan. Whisk in about the same amount of flour. Add about two cups of veggie broth, and 1/4 cup of nutritional yeast. Whisk in about 2 TB miso (or to taste). Whisk pretty constantly until it has thickened. Add pepper and paprika to taste. The family in a post-meal food coma. Pam, this food was definitely delicious! I would never have believed the gravy was not meat based and that the biscuits didn’t have little bits of ham in them! It was all very delicious! Thanks! Score one for the vegans! way to go Pamela!